Barbados governments prefer publicity campaigns over real environmental laws. Abandoned Bajan chemical drums. Thanks to successive DLP & BLP Governments, it's not illegal in Barbados. 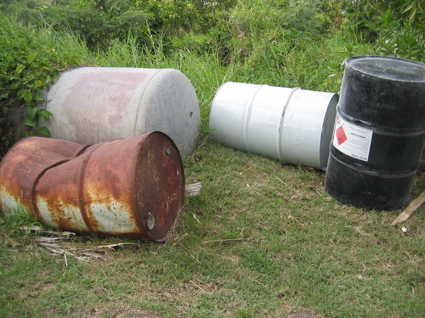 Barbados has no Environmental Protection legislation – so feel free to dump chemicals. That’s what companies do! Over five years ago, Barbados Free Press asked Barbados Chemical Dumping – What Would Jesus Do? And so the “feel good, look good but do nothing” environmental campaign of the DLP government continues with the latest announcement that a chemical safety project “is coming”. No environmental protection laws mind you: only nice feel good – look good publicity campaigns. Our current Environment Minister says he doesn’t believe in enforcing compliance and no wonder! You have to pass laws to enforce compliance with standards. It’s pretty basic. Thanks to successive BLP and DLP governments, Barbados has no laws about the handling or disposal of chemicals – but we’re great at promises and recommendations. Folks, please read the following at The Nation, and welcome to the third world. Here we are on September 2, 2011 – some 26 years and 8 months since our BLP & DLP governments first promised to pass a comprehensive Environmental Protection Act. It has been well over a year since Sue Springer, Executive VP of the Barbados Hotel and Tourism Association (BHTA) asked the DLP and the BLP where their promised Environmental Act went to – and still we have no action. No kidding? Really? Gosh, we’d never had known! Nothing but words. Words is all we get from these people. No action. No Environmental Protection Act. 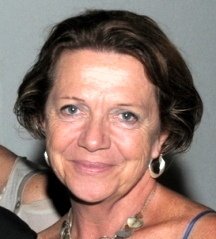 … Sue Springer, Executive VP of the Barbados Hotel and Tourism Association (BHTA) in the Barbados Advocate Protect environment to protect tourism sector. In 1991 the new DLP Environment Minister, Warwick Franklin, promised a “Clean Environment Law”. Nothing happened and no draft was ever seen.